Germany says it will remain “watchful” of Chinese carmaker Geely after it became the biggest investor in Mercedes-Benz owner Daimler. The German government warned the deal should not be used as a “gateway” for Chinese industrial policy interests. Geely, which has bought a 9.7% stake, says it hopes to co-operate with the German car giant on electric cars. The Chinese firm already fully-owns Sweden’s Volvo and black cab maker London Taxi Company. Geely’s $9bn (£6.4bn) investment has raised some concerns that the Chinese firm will seek access to technology and innovation in exchange for the deal. The German government said it would not block the investment, but Economy Minister Brigitte Zypries said it must “keep an especially watchful eye”. Germany is “an open economy that welcomes investments, as long as they happen in line with the market”, she told the German newspaper Handelsblatt. Nevertheless, Germany’s openness should “not be used as a gateway for other states’ industrial policy interests,” she said. It comes amid concern that Chinese firms could gain too much influence in European economies via foreign investments. Some also complain that the EU is much more open to investment from abroad than Beijing allows on its territory. In a statement by Geely, Mr Li said he wanted to “accompany Daimler on its way to becoming the world’s leading electro-mobility provider”, and was looking for a long-term commitment. Describing what he called a “strategic vision”, he argued that “invaders from outside” the traditional car sector, meant firms needed to co-operate through partnerships and alliances. 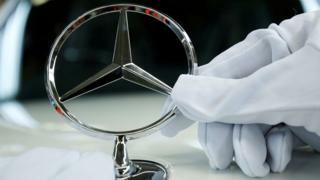 Also over the weekend, Daimler announced a $1.9bn investment into a partnership with another Chinese auto firm, BAIC. Daimler and BAIC are already co-operating in the Chinese market, where foreign production is often only permitted through partnerships with Chinese firms.